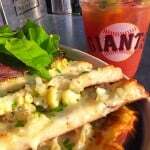 Eat Gluten-Free at Oracle Park, Home of the SF Giants! Here are the best options for eating Gluten-Free at Oracle Park (formerly AT&T Park) – home of the San Francisco Giants! Oracle offers lots of gluten-free options, plus a number of dairy free and vegetarian options too. Deliciousness for everyone in the city by the bay! Hearth Table in Giants Garden*: this 100% no gluten-ingredients used restaurant within the park features GF flatbreads, a sausage sandwich on a GF roll, gluten-free and gluten-removed beers, and a killer strawberry-bourbon smash cocktail. Garden Table in Giants Garden: this vegetarian restaurant offers from-scratch soups, salads and other fresh-from-the-garden seasonal options, and has GF options as well. Budweiser Brew Pub, section 112: the beer & hot dog stand just behind section 112 offers giant hot dogs in GF buns that are prepared and individually wrapped in a separate area, and gluten-free beer. Since the self-serve condiments at Oracle Park are in pump dispensers, you’re good to go there too! Ghirardelli Ice Cream and Hot Chocolate: visit the Ghirardelli stand or grab a hot chocolate from a vendor in the aisles, both options are gluten-free. Enjoy the eats – and enjoy the game! *The Giants Garden is located behind centerfield wall, just under the scoreboard. You can reach the garden by going down the stairs in the bleacher seats or use the stairs near Lou Seal Plaza. The 4,320-square-foot edible garden also features a bar that offers GF Bloody Marys and GF Cider. Here’s another tip for going gluten-free at Oracle Park: fans can bring in their own food! You can carry bags and soft-sided coolers, as long as they aren’t larger than 16x16x8. Get more info about what you can bring in here. Thanks to Hannah Schmunk from the Giants Garden for joining me for an interview! This entry was posted in Articles, Featured, G-Free Foodie Guides, KC's Blog and tagged celiac oracle park, g-free diet, G-Free Foodie, giants garden, gluten free at&t park, gluten free dining, gluten free food, gluten free health, gluten free mommy, gluten free oracle park, gluten free parent, gluten intolerance, kc cornwell, oracle park, san francisco giants gluten free, sf giants. Bookmark the permalink. This is actually a great article! good things to know! thanks for the insight.